I promise to use it only to send you Choose Wellness. Work from Home, Be Your Own Boss, Work when it suits YOU... sounds like a good idea. A change from the ideas instilled in us in the 'old' days – to work hard, get a good job and be assured of a secure future! But, there have been a lot of changes over recent years. There is no longer the same job security – and people seem to be working longer and longer hours, with less time for recreation and fun. It is becoming more and more common, and, in fact, necessary, for people to work from home or work at a second job or for Mums to be still in the workforce instead of being at home with the children. The Global Recession hasn't helped, and many people are losing their jobs. This is one reason for the big increase in the number of people turning to Internet Marketing and to Multi-Level or Network Marketing. There are many 'work from home' possibilities available to people today. The Internet has opened up the world to many opportunities.. not all of them good. I want here to give you a few ideas about some work from home options that we have researched ... it's all a matter of finding something that you are happy doing and will give you a decent income while you do it. You may like to download this FREE copy of the "Work-At-Home Moms Masters Course" with my compliments. It is literally everything a mother would want to know about starting her own Internet business from home. It has been written by Four Work-At-Home Moms, and explains, starting right from the beginning, just how they were able to build a substantial income online. Anyone who has been trying to establish a business online or who would like to expand to take advantage of the huge internet market will benefit from their realistic, "been-there-done-that," helpful style. Perhaps you'd really like to be a 'stay-at-home' Mum, be there for your children but bring in some income to keep things going. Lots of 'stay at home Mums' are discovering SBI as a means of earning that extra income - and are becoming 'work from home Mums' and having fun while they do it! Listen to what Elad, who has become a stay at home, work from home Dad, has to say about his Internet Business, the success of which he attributes completely to SiteBuildIt. How great if you can develop your 'hobby or interest' in to a means of providing some real income! If you have a passion or a hobby, or something that you are very knowledgeable about or just love talking about, you could turn it into a 'money earner'. Many people have done just that using this same system that I'm using to build this website. You can just 'put up' a website and hope for the best, or you can build a profitable work from home online business. Internet marketing ranges from selling things on eBay or selling your own products from your own website, to earning commission for promoting other peoples' products. It can cost very little, perhaps a few hundred dollars or less, but it may cost you a lot more if you aren't careful. There are so many tempting offers and when you start to look around ... you will deluged by tempting sales promotions. Remember, if something sounds too good to be true, it probably is. So, as they say in the Network Marketing Industry .."Do your due diligence." It depends where you are starting from. If you know a fair bit about the internet it might only take a few weeks, but for most people it will more likely take six to nine months, or maybe more. The important thing is, you can succeed... so do not give up. Many people, who start off with the idea of making some extra money 'on the side' by working from home, soon find that they have a substantial 'money earner' happening, and it becomes their main source of income. SiteBuildIt is the complete step by step information packed system that will help you to choose your market and show you exactly how to set up your website to meet your market. It will show you how to control and develop your site and how to make money from your site, while you work from home or wherever you are. SiteBuildIt (SBI) is with you every step of the way with detailed information. It places at your fingertips, all the systems that you need to help you to achieve success. It is a very comprehensive program and covers everything you will need to know, and then some. SBI is very reasonably priced, gives great value and offers tremendous support. It will literally teach you everything you need to know to be successful on the internet. I highly recommend it to anyone...whether they be NEWBIES to the net or more experienced. For just a small monthly fee, everything will be taken care of including very comprehensive training, web hosting, webmail, finding the best domain name - in fact everything you could possibly need to put up a successful web site. With SBI there is no need for you to read 100+ Net-marketing e-zines, blogs & feeds -- they do that for you. SBIX boils it all down and reports only the important material you need to know. You are always up-to-date and "noise-free." There are no back issues because all important information goes into the various HQs in Site Central. It's all part of the overall SBI! policy... SBIX & the HQs deliver all (and the only) key Web marketing news, strategies and analysis that you need. You literally gain tens of hours per week ignoring all the outside noise. Use that time to grow what's important... your business. Multi-level marketing has been around for a long time now and there are not too many people, particularly in my age group, who have not either been involved or known someone that has been involved. Recently, there has been a huge upsurge of interest and a whole new way of thinking about the industry. But isn't network marketing just a pyramid scheme?....and aren't pyramid schemes illegal? Listen here to what Ann Sieg, the author of 'The 7 Great Lies of Network Marketing' has to say about how to effectively build a network marketing business without cold calling and without harassing your friends and relatives. 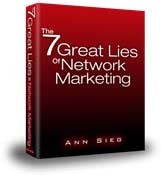 You can watch and hear what Ann has to say by just clicking on the image or the link, 'The 7 Great Lies of Network Marketing' and you'll be able to download this 'eye opening' book for free. Ann, known as the Renegade Network Marketer has partnered with Ken Evoy from SiteBuildIt to show people how to build their work-from-home network marketing business without harassing people. Since the overwhelming response to 'The 7 Great Lies ...',Ann has released the incredible Special Report called "The Attraction Marketer's Manifesto". This new Special Report picks up where her previous world-changing writing leaves off, and is a 'must read' for every business owner .. not just those interested in the MLM industry. It also shows why it's even more duplicate-able than the warm and cold market methods that many people are being taught to use! She shows how anyone - and I do mean anyone - can use attraction marketing to build an automatic online recruiting and selling machine. For low cost or not cost at all. You need to read it .... it's free and .... you can get it here. Just leave your details below to receive your FREE copy and learn how to make 'attraction marketing' work for you.